New Zealand is a country with a unique and interesting flora. These plants have evolved over countless years of isolation in these beautiful, pollution free islands. 80% of New Zealand's plants are found in no other country of the world. The Alpine flora contains many unusual flowers, usually white or yellow, shy miniature daisies, edelweiss and eyebright, pure white gentians, the giant white buttercup, the small, high Alpine yellow buttercup, and the delicate asymmetric hebes and parahebes. At the lower altitudes the lush rain forests dominated by the giant Kauri trees in the north, or lacy leaved southern beeches in the south, contain variety of evergreen flowering shrubs and a mass of delicate ferns and tiny ground orchids. 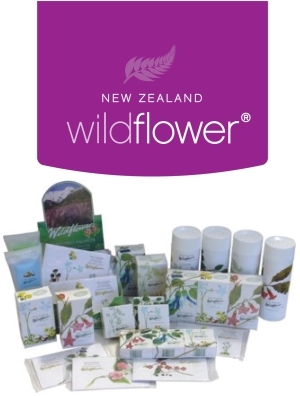 The New Zealand flora is not characterised by large showy bright coloured flowers, but rather by small delicately coloured flowers with a light fresh fragrance such as the Wildflower New Zealand Flora range. Wildflower products are manufactured to the highest standard, using only the finest materials available. Use and enjoy these products.